On 28th November, we went along to BIMA’s breakfast briefing on the Tech Trends that really matter for 2018, which saw six-minute talks from four speakers on their tech predictions for 2018 and beyond. Whilst there were definitely some resounding takeaways, including not doing something for the sake of doing it and ensuring you have a purpose, each of the talks offered unique and valuable food for thought. So, let’s look at each of them. With a background in mixed reality (MR), Luciana’s talk naturally focused on the future of MR, augmented reality (AR) and virtual reality (VR). Luciana explained that 2018 will see the convergence of augmented, mixed and virtual reality – with visual, real-world overlays. At the moment, AR is seen as a tool adopted by the masses, whilst VR is more isolated. While VR tech is more mature, AR is quickly catching up, which will eventually converge with VR. Luciana predicts that it will take around 5-10 years for these technologies, particularly VR, to hit the mainstream. And one thing that’s going to speed this along, is a drop in the price of headsets in 2018; with Oculus at the steering wheel. For Luciana, however, the barrier to adoption is the fact people see these as entertainment tech. She believes that VR can put people in other’s shoes to address real purpose – breaking down stereotypes, creating empathy and tolerance. Could VR make humans more human? The key takeaway was that if companies are thinking of adopting AR, VR and / or MR, then it is imperative that it has a purpose. She also recommended that the audience look into the VR fund, which you can find here. Guy discussed the development of artificial intelligence (AI) in 2018. Significantly, Guy believes that AI won’t end up replacing our jobs- despite warnings from the likes of Stephen Hawking, who thinks it would lead to the end of mankind. 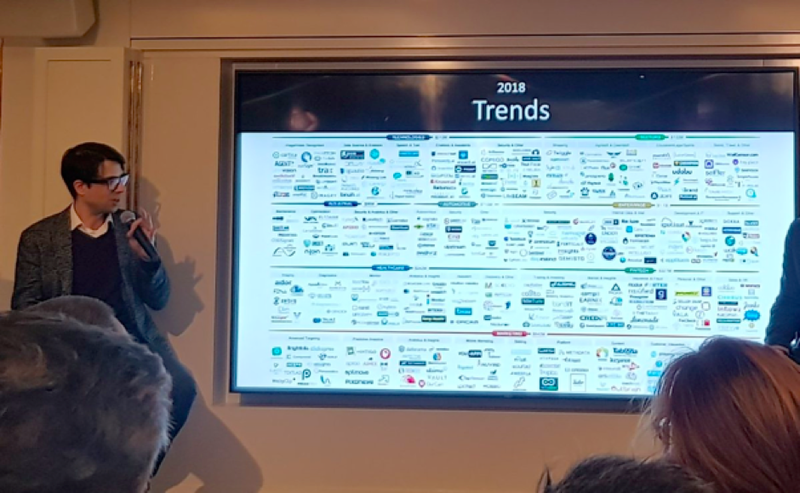 Looking at what happened with AI in 2017, Guy showed this powerful image, detailing the current AI startups in Israel alone. In 2018, Guy believes that we will see the wider adoption of voice AI, as well as more regular communication with bots. For companies and brands, we can expect to see more contextual behavioural targeting, more real-time, in-content advertising and, finally, lifestyle automation and hyper-personalisation. Matt explained that we’ll see more of Google’s services connected, making voice assistance much more embedded into everyday life. At the moment, it’s focused on news, weather, music and time, but with the design of the latest smartphones having a key focus on voice assistance, including the Pixel 2, it will become a more day-to-day necessity. Matt also thinks we’ll see more unique brand experiences that go beyond shopping. The Christmas campaign from John Lewis and Google, for example, allows children to use the Google Home smart speaker to interact with its story about Moz the Monster. If you want to see more, you can watch the full talk here.